As much as we love dining out, my favorite part of the week is cooking Sunday supper with Nick. We usually reserve this day for any slow-cooking or soups / stews, and start early so that the aromas fill the house by the time afternoon sports are on. 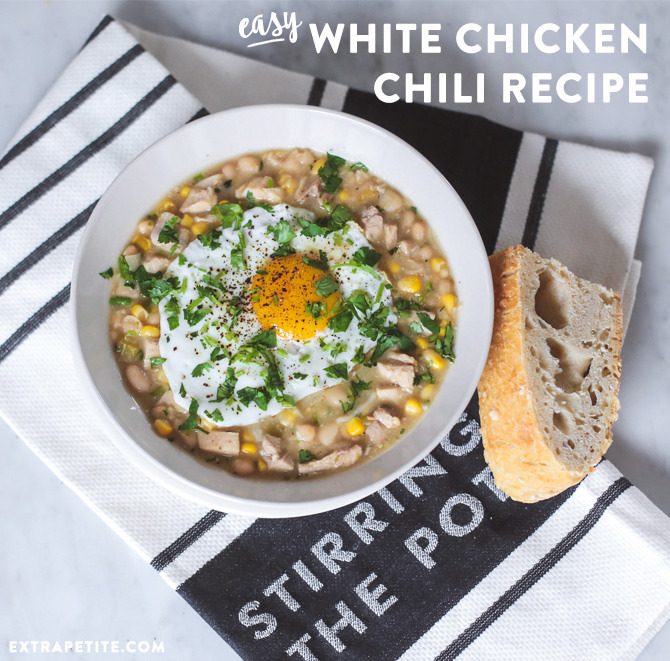 This weekend we made both my favorite dutch oven crusty bread and white chicken chili – the chili is easy enough for beginners, takes under an hour, and boy is it flavorful! Nick likes his brunch-style topped with a sunny side up egg. Read on below for the recipes! 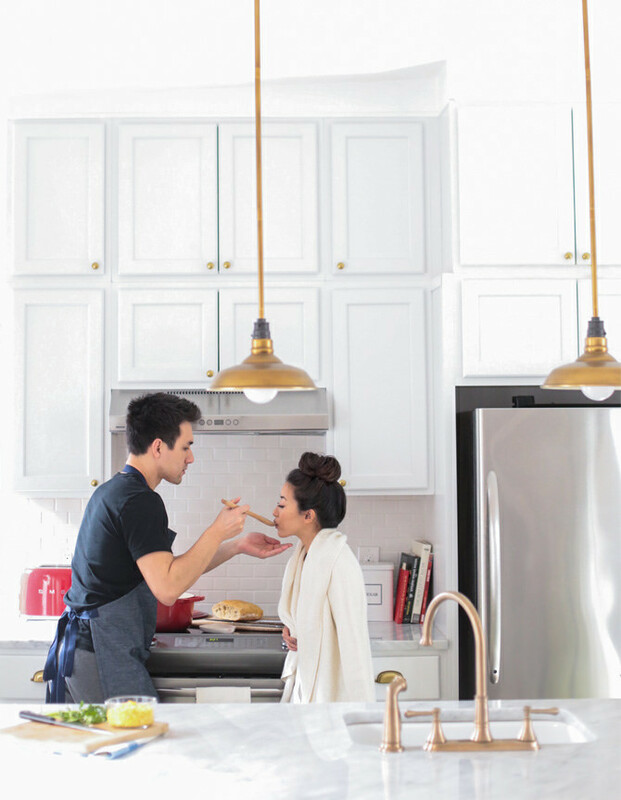 I’m also partnering today with Macy’s registry to share some of our favorite, useful registry-friendly items! Snapchat friends probably see our Le Creuset cast iron oven on the regular, producing stews, roasts, bread, and so much more. It’s quite heavy, so an added benefit of use is an extra arm workout! Martha Stewart also makes a more affordable cast-iron pot collection that my mom uses and recommends. Our pot was thanks to a generous friend Liz who makes yummy “dutch oven crusty bread.” It’s soft on the inside, just perfect while warm with a pat of butter or olive oil. She got her pot as a wedding gift with the bread recipe card inside, and passed the tradition on to me since I always asked her to make it! We couldn’t resist baking a loaf to go with dinner (recipe here; instructional video here) – I’m no baker, but this is the simplest bread you’ll ever make. Just make sure to use instant yeast per the recipe, or proof your non-instant yeast first. On to the chili – I love a good recipe that serves as a guideline, but can easily be adapted for individual tastes or for vegetarian friends (try veggie broth instead of chicken; extra beans and veggies instead of meat). Adapted from Cathy on Allrecipes. Serves 4. * If you like it hot then include jalapeno seeds, otherwise remove them. Be careful and don’t let your bare hands linger on the inner membrane & seeds! I learned this the hard way years ago and had hands on fire. ** Original recipe calls for 3.5 cups broth which was a little soupy. 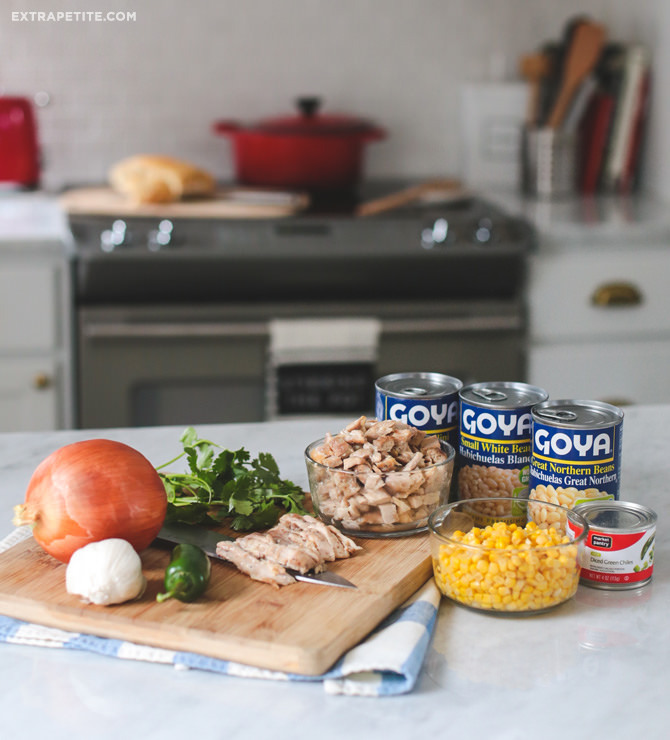 You can tweak the ratios of broth, chicken, and beans based on your liking. *** We use boneless, skinless chicken thighs seasoned with salt, pepper, and garlic powder. Wrap in foil to keep juicy, and bake for 20 minutes on 400 degrees. If they’re not fully cooked at this point, they will be in the chili. Ground chicken or turkey would be interesting too! 1. Heat the oil over a large pot on medium-low heat. Cook and stir the onion until tender. Mix in the garlic, jalapeno, green chile peppers, cumin, cayenne, and oregano. Continue to cook and stir the mixture until tender, about 3 minutes. Mix in the beans then chicken broth, and simmer for 15 minutes stirring occasionally. 2. At this point if you want a thicker texture, dip an immersion blender into your pot, and pulse a few times to puree some of the beans before adding chicken. Otherwise, just stir in the chicken and simmer another 15 minutes. 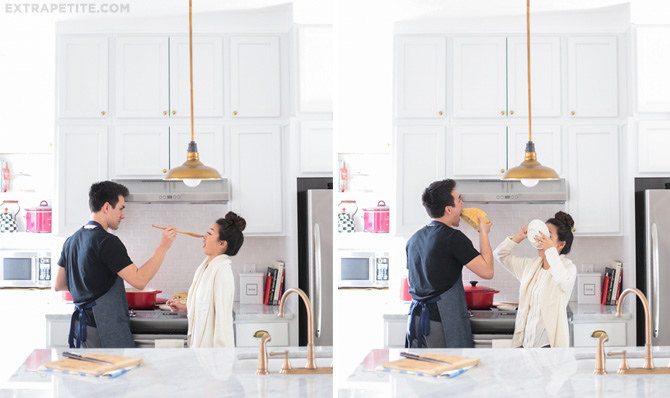 We’re obsessed with the Cusineart smartstick (ours is a prior model) which we also got as a gift – it’s a food processor, whisk, mini blender, and immersion blending stick all in one. 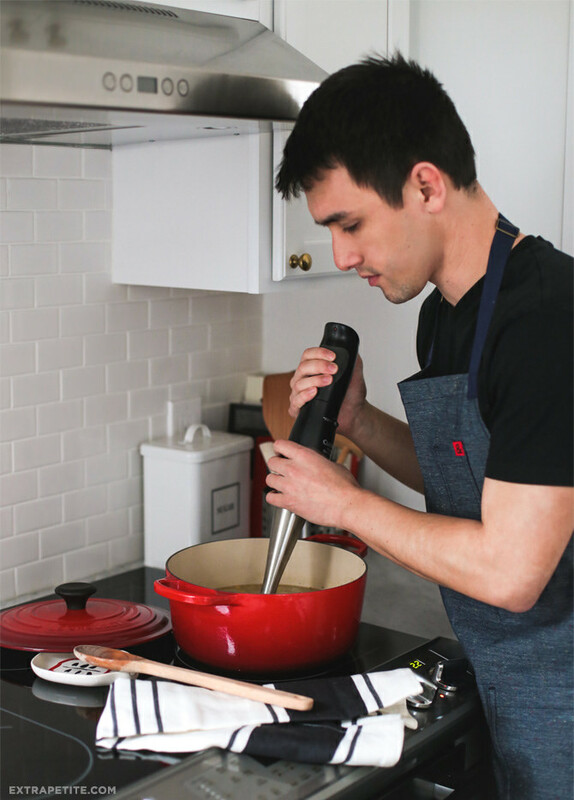 The immersion stick is a must if you like making creamy soups – no messy & dangerous step of pouring hot soup into a blender! 3. 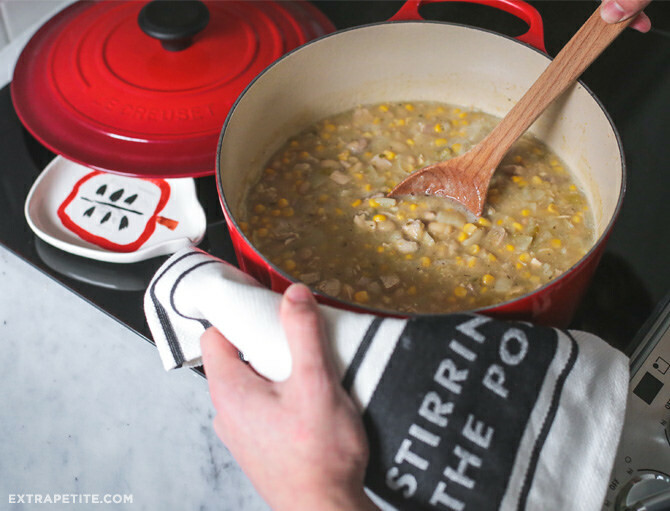 Stir in optional corn at the end before turning off the heat. Serve hot and top with garnishes. I just love the added sweetness of corn and some fresh cilantro with the spices in this! Here’s a few other gift-able items that we have and love. Readers – what was your most memorable wedding gift received? Thank you Macy’s for partnering on this post! You two look so cute together! I tried your recipe with all your revisions, and it was perfect! The decreased broth made for a perfect stew consistency, and the thighs were amazingly flavorful. I added a heaping handful of cilantro to finish. My new favorite stew-y food (previously was beef stew!) Thank you for sharing!! You are such a lovely couple! Your Sunday mornings looks like a real fairytale!